Days after completing her qualifying exams, these exact words were spoken to an African-American female student studying Neuroscience by her professor. Whether or not that was his intention, the words made the student feel as though she wasn’t competent. These sorts of disabling expectations can have a detrimental impact on one’s self esteem and sense of belonging, especially if no one else in your department looks like you. Historically, women and people of color have been discredited as being less capable or competent than their majority peers. Clearly, this sort of thinking is still strong and present today. As we work toward being more inclusive, understanding the history of equity struggles for marginalized groups and how impactful words can be is vitally important to creating an inclusive and welcoming culture. This was said to a first-generation student who was taking 15 credit hours while working 35-40 hours each week. She often found herself playing “catch up” in her classes because some of the topics covered in her introductory biology class were new to her. Often, first-generation students are mapping new territory all alone. Because they are the first person in their family to go to college, many don’t have the same support systems as their peers and may even be working full-time jobs to help support their families. As one student in the film pointed out, many people find it difficult to see a situation from a perspective other than their own. Taking the time to have an open conversation with students (or colleagues!) who may come from a different background than you is critical to understanding their challenges and developing solutions. The experiences of my friends and colleagues of color are all too similar to those featured in the film. We all have faced instances where we have been told, in one way or another, that we did not belong. But what has gotten me through are the formal and informal support systems I’ve built at the different academic institutions and workplaces I’ve found myself in, where I’ve often been the only person of color who was a woman. Being able to see yourself represented in your organization and network with people who have a similar background is vitally important. It is not enough to simply recruit and hire for diversity; organizations should make serious efforts to support underrepresented groups. Tactics such as creating affinity groups or other safe spaces have shown to be effective. These provide opportunities for individuals to be themselves and connect with others who may have the same experiences as them. Organizations can also take time to understand inclusion strategies. 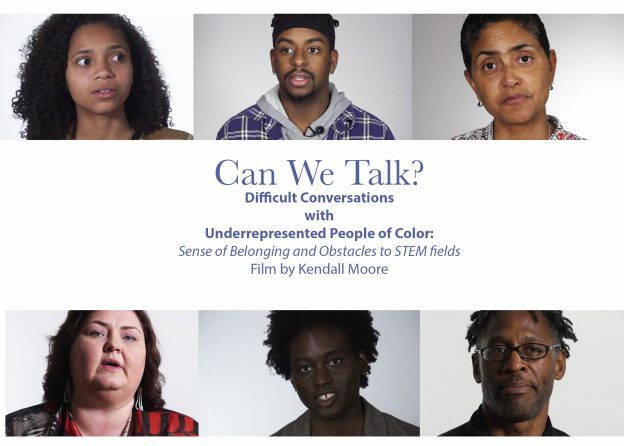 As we look to diversify our workforce and higher education institutions, it is important to understand how to best connect with and support underrepresented groups to create a truly inclusive space. I couldn’t agree more Jessica! I worked at an institution that wanted to increase the diversity of its student population but then had no plans to make their campus inclusive. They just didn’t have a clue. Difficult conversations must be had and work has to be done by all to create a inclusive environment. After some hard lessons, this college stepped up and held a series of listening sessions to learn from their students what was needed. Then workshops around understanding bias and addressing it within yourself and others took place. College faculty and staff began sharing their own diversity (i.e. unseen diversities such as first generation, low income, and sexual orientation) and opening their doors to support students. In the end, I was proud of the work this college was able to do. As a retired middle school principal and adjunct professor, I saw the “word” go from desegregation, to integration, to multicultural, to pluralistic, to diversity; 1978 to 2018. There is solid evidence that progress has been made and substantial proof that the intolerance that underlies the prejudice serving the bias that supports the bigotry continues. We see, hear and experience more minority groups in almost all walks of life. We see, hear and experience blatant bigotry reminiscent of pre-civil rights successes. Tolerance is where we start. If we can’t end our differences at least we can make it safe for a mixed bag of Americans.